On this day in history, the 20th of April 1534, Elizabeth Barton, known as “the Nun of Kent” or “the Holy Maid of Kent”, was hanged for treason at the gallows at Tyburn, but who was she and what did she do to deserve such a death? Elizabeth Barton went from being an ordinary servant girl to a religious visionary in 1525, at around the age of nineteen. She was working in a household in Aldington, Kent, when she was taken ill and fell into trances where she had visions which were “of marvellous holiness in rebuke of sin and vice”. Richard Master, the local parish priest, was convinced that her visions were genuine and so reported the matter to William Warham, the Archbishop of Canterbury who sent a commission consisting of her parish priest, a diocesan official, two Franciscans (Richard Risby and Hugh Rich) and three Canterbury Benedictines (Bocking, Hadleigh and Barnes). This commission as also convinced of Barton’s sincerity and pronounced in her favour. Shortly after Barton was examined, one of her predictions came true – in front of a large crowd, Barton was cured of her illness by the Blessed Virgin. At this time, her visions and prophecies seemed harmless as they were simply encouraging people to live a good Catholic life. After being cured of her illness, Elizabeth Barton left her job as a servant to become a Benedictine nun near Canterbury. She carried on having visions and became a bit of a celebrity, becoming known as the “Nun of Kent” or the “Holy Maid of Kent”. People would undertake pilgrimages to see this nun who was thought to communicate directly with the Virgin Mary. She was humoured by the English government, and even corresponded with people like Sir Thomas More and Bishop John Fisher, and actually met with Cardinal Wolsey, but then she started opposing Henry VIII’s plans to annul his marriage to Catherine of Aragon and marry Anne Boleyn. No longer was she a harmless nun, she was a threat to Henry VIII’s popularity and what she was saying could be classed as treason. According to Nancy Bradley Warren, author of Women of God and Arms: Female Spirituality and Political Conflict, 1380–1600, in 1532 Elizabeth Barton claimed to have been miraculously and invisibly present when Henry VIII attended Mass in Calais during his visit to see the French King. She reported that an angel denied Henry the consecrated host, removed it from the priest’s hands and, instead, offered it to Elizabeth Barton. She said that this was a clear sign that God was displeased with Henry. Barton also prophesied that if Henry proceeded with his divorce and married Anne Boleyn, then he would lose his kingdom within a month and “should die a villain’s death”. Nancy Bradley Warren writes of how Elizabeth Barton and her prophecies “struck at the heart of Henry VIII’s foreign policy and, perhaps even more significantly, at the heart of his representation of the English monarchy”. It was clear that she was now a threat to Henry and his plans and this threat had to be dealt with. 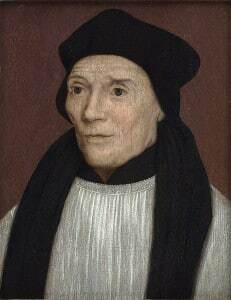 In 1533 Elizabeth Barton was examined by the new Archbishop of Canterbury, Thomas Cranmer. Having had her reputation damaged by rumours of sexual misconduct with priests, it is said that Elizabeth Barton confessed to fabricating her prophesies. Barton. She was then imprisoned in the Tower of London, along with her supporters like Bocking and Hadleigh, and forced to do public penance and make a public confession at St Paul’s Cross. Eliz. Berton, nun, Edw. Bokkyng, John Deryng, Ric. Master, Harry Gold, Hugh Ryche and Ric. Rysby. These by the Act shall be attainted of high treason and suffer death. 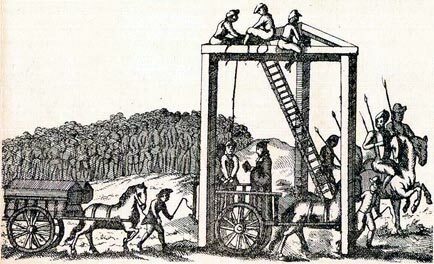 On the 20th April 1534, Elizabeth Barton and her accomplices were executed at Tyburn gallows. It is not known whether Elizabeth Barton confessed of her own volition or whether she was tortured, either physically or psychologically. It is impossible to judge whether Elizabeth was a fraudster, mentally ill or medically ill. She may have suffered from fits, she could have been delusional or perhaps she did have visions or what she believed to be visions, we just can’t say. She did manage to convince a lot of people though, didn’t she?! At the end of the day, Elizabeth Barton may well have been a tragic victim of a society where mental illness or medical conditions, such as epilepsy, were completely misunderstood. She challenged a king and that king won. Attainder of Elizabeth Barton and Others – Letters and Papers, Foreign and Domestic, Henry VIII, vii 54, 70. Thanks for another interesting article! You make a good point about her possibly suffering from epilepsy. I personally believe that she suffered from a delusional mental illness, but there are so many possibilities. Her story reminds me of Jeanne d’Arc! Thanks for the article! We have in our family a history of our branch of the Bartons, written in the 1930’s. The author claims that we are descended from the Nun of Kent, but I don’t know whether to believe her or not, given that her scholarship is dubious in several instances in her book. She also claims that Elizabeth Barton was hanged, drawn and quartered–is this true? Sources suggest that Elizabeth Barton was hanged, rather than being hanged, drawn and quartered. It is interesting that you have such a book in your family, I’d love to trace my family back to Tudor times but it’s a rather big undertaking! Kent’s an interesting place in Tudor times – a hotbed of protestant-leaning revolt. In Wyatt’s rebellion, an astonishing number of Kentish men and Men of Kent rose up – 63 from one small village, Smarden, which even now has a population of only 2,000 or so in the parish. Elizabeth Barton was a nun, with no known marriage or children, so I doubt there are descendants? I think Serena probably meant through the family, through brothers and sisters, rather than Elizabeth herself, but I know what you mean as people often claim to be descended from Anne Boleyn and I think “how?”. I think she was just hanged. As far as i am aware, women were not hanged drawn and quartered.It’s hard to say what was really going on with her. It could have been epilepsy, or something else.Don’t know if there are any records of her medical history if any. been the nature of the visions. I assume they had some knowledge of the bible or read the early church fathers, and may have thought that what she told them was consistant with Catholic teachings of the time period.Don’t know how well she read or wrote. Somewhere along the line she got off track so to speak. He visions condeming Henry no doubt could have been influenced by visitors to the monastery she lived in,and amongst the sisters themselves there may have been mention of the King’s Great Matter. After all, England was a buzz with the business of Henry,Anne and Catherine. There is some thought,forgot where i read it, that she might have been manipulated by others more powerful,thinking that Henry would heed her words and dump Anne, the nun being a mouthpiece,saying what they felt, but afraid to say openly for fear of having their lands and such confiscated and or thrown in the Tower. If there is any undercurrent of truth to that, Henry proved them wrong by executing her, since being a nun and a supposed reputation as a holy person,was no guarentee of safety where Henry was concerned. St.Thomas More was no dummy, and rightly had the sense to stay as far from her as possible. I have been fascinated by Elizabeth Barton for a number of years ever since finding a large, bright yellow book about her in Oxfam. I was intrigued to read that she at first was not regarded as a fraud, or a heretic, or a lunatic, or a traitor, but was regarded as holy by even Henry VIII, who actually met and spoke with her. Sir Thomas More found her to be harmless and I think that even Thomas Cramner did not find her to be a threat, at first. It was when things started to go a little wrong for Henry and Anne in 1534 that I believe this changed and that she was examined again and matched to other so called traitors. Her fellows were also suspected because they were preaching stuff that made the government shaky and it is no wonder that they then went back and accused Elizabeth of treason. I am a little surprised however, that they did not execute her the correct method for treason for a woman, or did they think that there was something in what she said? May-be the Tudor dynasty was doomed and may-be Anne was doomed. (Sentence for female traitors is the even worse punishment of burning at the stake) In England we hang witches, so did Anne think that she had put a curse on her? Who knows what Anne was thinking? There is some suggestion from hostile sources that Anne was losing her mind and her grip at this time and that she was afraid from the moment she married Henry. I just can’t help but to facepalm every time I read about those who challenged Henry VIII on religion or on his authority over them. It never ended well, and the endings were so exquisitely pain-filled and brutal. A funny note on researching family history. I believed all my life my fathers family were strict Catholics going back many generations; imagine my surprise to find out my grandfather was the first! He converted from a little known cult in Czechoslovakia in the early 1900’s to marry my Catholic Grandmother and became a stricter adherent than she ever was! Then to my surprise I found out on my mothers side I am a direct descendant of the brother of a famous Native American Warrior who attacked and murdered many settlers in Texas, both brothers married and raised a family with white women captives and mine ancestor had ancestors who were indentured servants from England! Talk about a mod podge of DNA! So to any who claim they are related to Queen Anne, she did have relatives and they could be distantly related! “Related” is one thing, “descended from” is another, and “having a common ancestor further back” is possibly what is meant. Yes it’s my real name. Weird how someone can go from being holy to being crazy depending on their opinion of a politician and his actions. She, along with five of her chief supporters, four of whom were priests, including Risby and Edward Bocking were hanged for treason at Tyburn. She was buried at Greyfriars Church in Newgate Street but her head was put on a spike on London Bridge, the only woman in history accorded that dishonour. In Australia some of us still remember the good old days when we were regarded to be proud and grateful to call ourselves legally British Subjects, with a British Subjects’ Passport! Now political correctness has us all described as Australian Citizens…. it almost feels like treason…Oh Hum! “Treason!”? Your helpful recount of both Sir Thomas MORE & Elizabeth BARTON and other like minded conscientious people is/can be a timely reminded to Australian people of good will, of all or no religious affiliation, to PARTICIPATE in the Roman Catholic Church’s PLENARY COUNCIL 2020/21. See: http://www.plenarycouncil.catholic.org.au/resources/watch/ We have till Ash Wednesday 6 March 2019 to respond. It is indeed inspirational to learn from the life and ‘execution’ of Sir Thomas More at the bloodied hands of a corrupt murderous king and administrators. Why do we find inspiration from Saint Thomas More? Because today’s murderous corruption is still present in Church & State Governments world wide. Hopefully, Australians’ participation ( a first!) in the 2020/21 Plenary Council will send a message to the Bishops which will contribute positively to the much needed REFORM of the RC Church. It was inspirational to see how the soul, the spirit of a good man in love with Jesus Christ of Nazareth concluded that he should decide – To be a chaste husband rather than an impure priest.- While miracles happen sometimes… Grace builds on nature every time! following that other unspeakable National Tragedy declared as such by both the Prime Minister and the Leader of the Opposition on the completion of the 5 years research of The Australian Royal Commission into Institutional Children Sexual Abuse 2013-2017. Father Kevin LEE is the good Priest who kept a diary for 20+ years to prove that some of our celibate Priests can and do some times live a double life and, some abuse children while they are ‘protected from prosecution for their crimes, by the Church. Q. Who was with Kevin LEE when he died? – is the question that journalist Frances Jones keeps on asking on line. Vox Populi claims that Father Kevin Lee was murdered in a Philippines Island. The credit for the Royal Commission into Institutional Child Sexual Abuse is primarily due to Father Kevin ….may his soul continue his Christian mission. His diary/book, self published because no publisher would publish it with all the name of the clerical perpetrators that Kevin had observed and met and knew were written in his diary. “UNHOLY SILENCE” is its title, on line. Loving Blessings to All involved in these historical publications for good health, joyful days with all your families, friends and colleagues here, there and anywhere on this fragile planet, right back from the beginning of time. Amen!